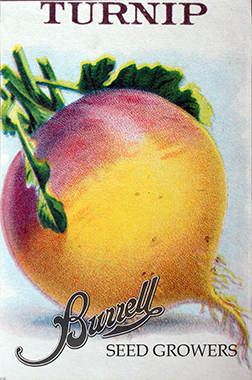 Turnips are a multi purpose vegetable grown for the delicious greens or roots, as fodder for livestock or as a winter cover crop. Turnip roots break up and add organic matter to the soil. Often cows or sheep are grazed on fields with turnips, eating both the greens and the inside of the turnip. Turnip greens are cooked much like kale or collards, but a dash of brown mustard really brings out the flavor. Whether roasted, mashed or sautéd with fresh ginger turnip roots cook up nicely. This under appreciated vegetable added to soups and stews enriches the broth. A savory bacon, turnip mash or oven roasted chunks complements any roast dinner. 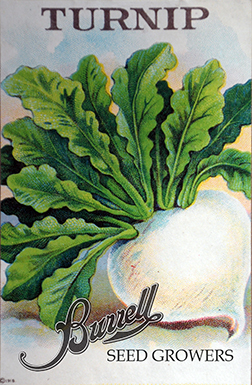 Super easy to grow turnips can be sown in the spring, fall or in cool climates throughout the season. Direct seed 2 to 4 weeks before the last spring frost date. Plant a few seeds every couple of weeks in cool climates for a continuous supply. For the fall, farmers say “Plant turnips by the 4th of July, wet or dry.” It is possible to plant later than that for hot, long season areas, as they mature in 50 to 55 days. Sow seeds 1/4″ to 1/2″ deep in rows18″ to 2′ wide. Thin to a 4″ spacing when seedlings pop up. Keep seed bed evenly moist while germinating and sprouts are little. Every few days to weekly is fine after that, except for during dry periods. Turnips grown in hot, dry periods will become tough and woody, so avoid planting during the dog days of summer. Good companion crops are onions and peas. Bad companion crops are potatoes.